Metal Powders and P/M products are advanced materials that contribute to products with improved performances in various fields. They are used widely as structural materials and functional materials for electronic devices. Sanyo Special Steel incorporates the metal powder production technology, a combination of vacuum melting and inert gas atomization, to produce high-quality Metal Powders with limited impurities and high fluidity. 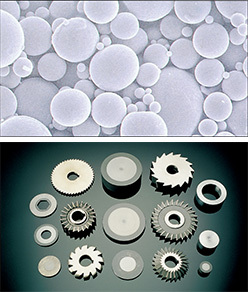 We also produce P/M products from such Metal Powders, incorporating our unique forming technology. AcrobatReader is required to view PDF files. Low-oxygen and high-purity spherical Metal Powders are produced by a combination of vacuum melting and inert gas atomization. We can satisfy requirements for alloy type (component) and grain size. Using a compact atomizer, we can produce small lots for timely development of commodities and other purposes. P/M high-speed steel of high-cleanliness is produced by forming metal powder manufactured by a combination of vacuum melting and inert gas atomization. The material features high toughness, strength and abrasion resistance. High-carbon, high-chromium steel that cannot be produced by the melting method is manufactured by forming the Metal Powders produced by a combination of vacuum melting and inert gas atomization. The new high-alloy tool steel features much higher corrosion resistance and wear resistance than the SUS440C series. The Bimetallic material is fully bonded metallurgically. Various combinations of alloys are possible. Bimetal of various metals is possible on the inner surface of thin and long pipes, which is difficult to be performed by thermal spraying or weld deposition. Makes it easy to bond materials that are difficult to be processed. Tubes and bars made from this material are characterized by very low segregation, because Metal Powders produced by a combination of vacuum melting and inert gas atomization are formed by the hot extrusion method to produce the material. Small-diameter and thin tubes can be produced by cold processing using a cold pilgering mill. The material exhibits superior corrosion resistance under various corrosive environments. Mechanical properties are identical to those of cast materials. They are fine and uniform in metallographic structure because they are produced by carrying out hot extrusion of Metal Powders. We can satisfy requirements for alloy type, size and quantity. The material features microstructure and uniformity in components. Excellent noise absorption performance in the GHz band. Effective for improvement of core material inductance and reduction of loss. Features uniform and high-level soft magnetic characteristics.